Finally - a gift as American as... well, Apple Pie! We take a light a flaky crust and overfill the pan with as much apple, cinnamon and brown sugar as humanly possible, then bake it to perfection. Heat upon arrival for second and share it ala mode with your favorite ice cream for a true dessert sensation! This homestyle baked pie has been made to the most exacting standards for a true homemade taste that they will not forget. Serves 6 to 8. Finally - a gift as American as... well, Apple Pie! 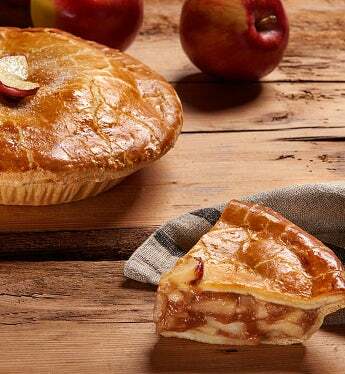 We take a light a flaky crust and overfill the pan with as much apple, cinnamon and brown sugar as humanly possible, then bake it to perfection. Heat upon arrival for a few seconds and share it ala mode with your favorite ice cream for a true dessert sensation!